A village or small town that lay on the East Road through the Shire, approximately midway between Frogmorton (about ten miles to the west) and the Brandywine Bridge (a similar distance to the east). It lay at the western edge of the Bridgefields region of the Eastfarthing. 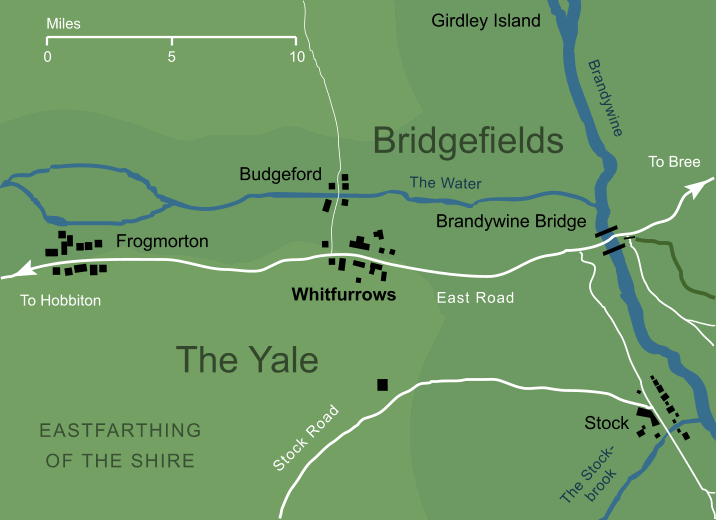 Whitfurrows is hardly mentioned within Tolkien's work, though it does appear to have been a centre or staging-post of some kind for the Shirriffs during the War of the Ring. 'Furrows' are the tracks left in newly-ploughed soil, and the fact that they were evidently white implies that the land around Whitfurrows had chalky soil. This is consistent with various other references to the land around the Shire being heavy in chalk. For example, when the Town Hole at Michel Delving collapsed, Mayor Will Whitfoot was 'buried in chalk' (The Fellowship of the Ring I 9, At the Sign of the Prancing Pony). This is reinforced by the fact that Michel Delving stood on the White Downs, and indeed the name 'Whitfoot' itself, meaning 'white foot', gives us another potential connection to chalk. Michel Delving was the in the west of the Shire, but the chalk deposits clearly ran some way to the east, through Whitfurrows and beyond. When Frodo and his companions visited Tom Bombadil, whose house lay east of the Shire beyond the Old Forest, they found a 'white chalky path' leading to his door (The Fellowship of the Ring I 8, In the House of Tom Bombadil).